Being from the Minnesota/Wisconsin area, but living in Pittsburgh, we tend to drive through Chicago 2-3 times each year. The GPS and online mapping services suggest taking I-90 all the way through Chicago, taking the Chicago Skyway to the Dan Ryan to the Chicago Circle to the Kennedy Expressway to Rockford. While that route is indeed the shortest highway route in terms of distance, it’s almost guaranteed to be very congested with lots of traffic, and ends up being slower in the end compared to other routes. Over the past five years of driving through Chicago a few times per year, we’ve decided that taking I-290 and I-294 is the best way to bypass as much Chicago traffic as possible, without increasing the overall driving distance too much. 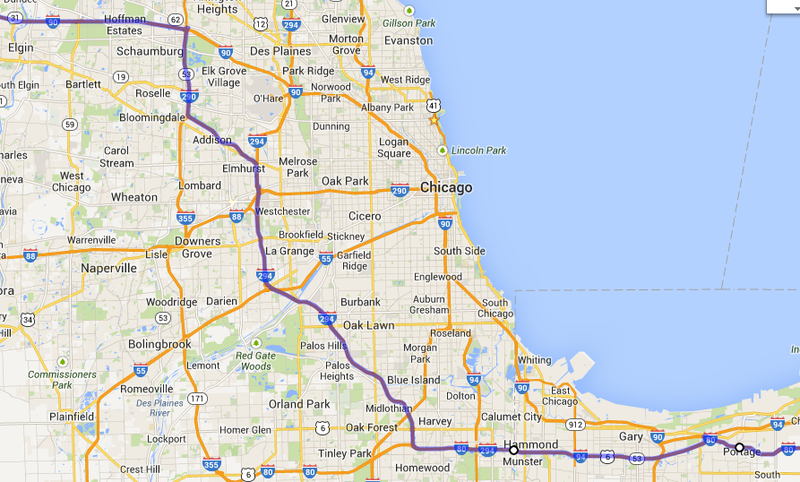 I-94W will peel off after a while and head North into Chicago. The transition from I-80W to I-294N is really easy, as I-80W has to exit and cross over to head further West, while you just stay in the center lanes for the curve toward the North. The transition from I-294N to I-290W is somewhat tricky, and is usually the only place we encounter any traffic-based slowdown. It’s a silly right-exit loop-under, that sometimes gets backed-up a few hundred feet owing to the slow speeds on the tight loop. Merging with the I-290W traffic isn’t too bad. After that, the transition from I-290W to I-90W is a standard cloverleaf loop, and it has some nice protected “feeder” lanes to make your merge really easy. 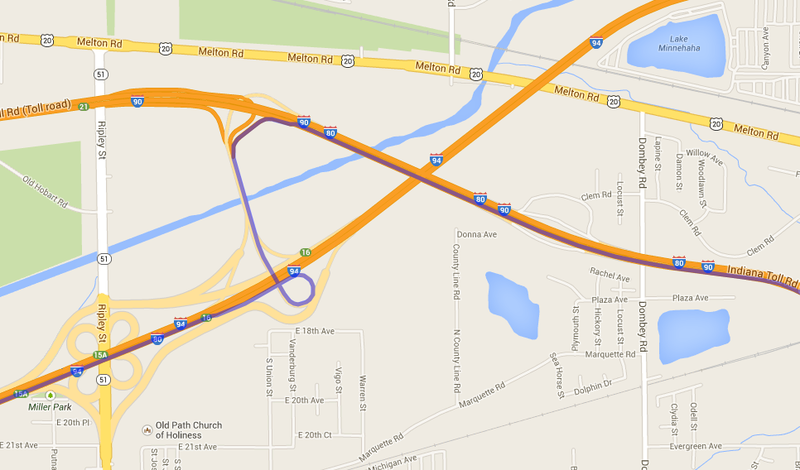 Eastbound Route Details – Heading from Wisconsin to Indiana, first you need to exit from I-90E to I-290E, which is a simple right exit, so there’s no picture here. The transition from I-290E to I-294S is much simpler than the opposite-direction transition loop-around shown above, and is just a simple “keep right” sort of bump around the interchange. 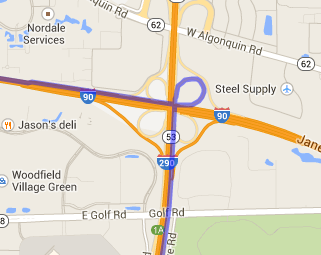 The transition from I-294S to I-80E is trivial, as is the interchange where I-94E merges into I-80E. 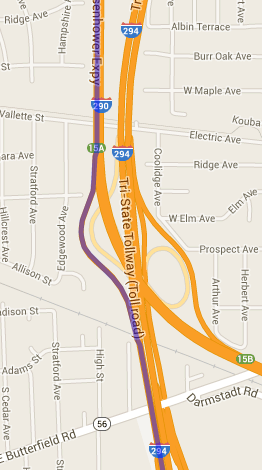 The only tricky bit remaining is near the Indiana state line where you merge from I-80E / I-94E onto I-80E / I-90E, which has a silly cloverleaf bridge thing. 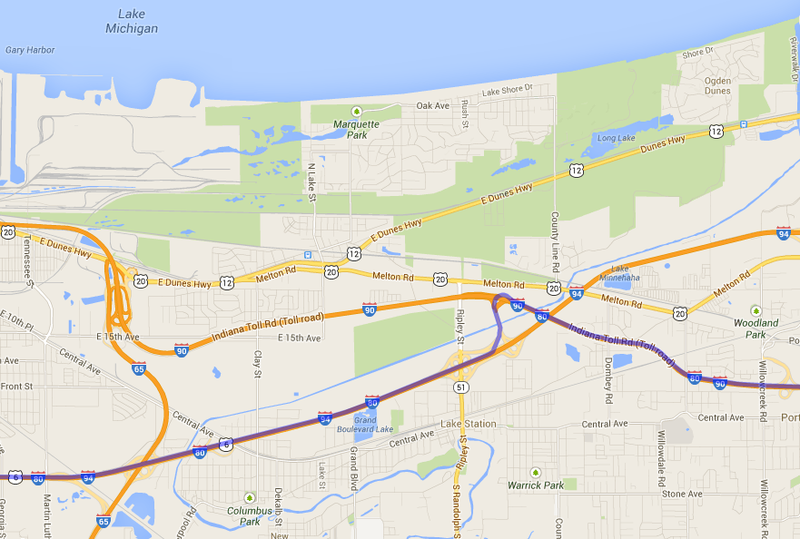 Overall, a pretty easy route, usually with no significant traffic that would be easy to avoid. There are definitely some tolls along the way, but I think all the Illinois toll plazas have open-road tolling, so get your EZ-Pass and save time and money. If you get your EZ-Pass from Pennsylvania (you don’t have to be a PA resident) and elect for paperless billing and connect your credit card for automatic reloading of funds, there are no monthly or yearly fees! Good luck getting started with homebrewing, it’s a ton of fun! Forgive me if you know some or all of this already, but I thought I’d send you some general info from my perspective after a few years of reading up on and then actually brewing a bunch. To make beer, you get sugar from barley and add it to some water, boil it for an hour or so, add hops during the boil, then cool it down, add yeast, and let it ferment for a few weeks. Then, either put it in a keg or bottles. The two main categories of beer, at least from the homebrewing perspective, are ale and lager. Ale yeast ferments best at higher temperatures (65-76 degrees F). Lager yeast ferments best in the 45-55 range, so you need to keep it cooler in order to do lagers. Most homebrewers start by brewing ales, since the temperature requirements are more compatible with most houses. I have a basement storage area that’s pretty constantly 65 degrees that I use for fermenting. I haven’t done a lager yet, but I have had good success brewing an Oktoberfest using ale yeast, that has turned out pretty nice two years in a row. If you want to brew lager styles of beer, many homebrewers get an old chest freezer and an external controller to do that. Most people who get into homebrewing start with Extract Brewing, where someone else did the hard work of extracting the fermentable sugars from the malted barley. Extract comes in both powder form (dry malt extract, DME) and thick syrupy form (liquid malt extract, LME), but they are functionally equivalent. More advanced brewers have extra equipment and can start from raw malted barley, and extract the sugars themselves, which can be cheaper, and there is a much wider variety of grains available (dozens) than malt extract (4-6 types). I don’t have room for doing all-grain, so I’m sticking with extract brewing until I have a larger home, and I’m perfectly happy with how my beer turns out. Hops come in dried pellet form (vacuum packed in nitrogen for freshness) generally in increments of an ounce. Most styles will have 1-2 ounces for a 5 gallon batch, but strongly-hopped styles like IPA will have 4+ ounces of hops. Hops add two characteristics: bitterness and aroma. Hops that are added at the start of the boil have all their aroma boil off so they don’t contribute much aroma, but their alpha acids (which require heat and time to activate) add bitterness. Hops that are added at the end of the boil (or even after the boil) don’t have enough time in the heat to contribute much bitterness, but they contribute lots of aroma. Yeast is either dried (in a packet, which lasts for years) or liquid (in a test tube or foil pouch, which needs refrigeration since it’s perishable). There are only a couple strains available in dried form, but dozens of strains available in liquid form. I like to order extract ingredient kits by mail order, and then pick up the suggested liquid yeast from the friendly local homebrew shop, but also have a couple packets of dry generic ale yeast on hand in case I forget to pick up liquid yeast. You add the yeast after cooling the beer down to room temperature. When I first started I would fill the kitchen sink with ice (or snow, yay winter) and set the pot of boiling wort in the ice, then stir the wort like crazy to cool it down. Last year for Christmas my parents got me a nice copper coil that I can hook up to the cold water tap, so I can chill my wort down from 212F to 80F in about 5 minutes, which is nice. Fermentation takes 2 weeks or more, depending on the style, and how strong the beer is (how much sugar is in the water). Strong beers generally take more time to ferment. During the fermentation our yeast buddies convert sugar into CO2 and CH3CH2OH (plus other flavors), but we just vent the CO2 to the atmosphere with a one-way airlock. I usually use food-safe 5 gallon plastic pails, since they are cheap and won’t break, but many people like to use large glass 6.5 gallon carboys, since they don’t retain colors or odors from previous batches, and won’t get scratches in the sides (which can be difficult to clean and harbor mean bacteria), but I haven’t had trouble with plastic pails. After fermentation is finished, you either keg or bottle the beer. I don’t have room for a kegging setup, so I bottle my beer, but I can’t wait until I have room for kegging. With kegs, you just transfer the fermented beer into a clean keg, then use the CO2 tank to force carbonate the beer, and it’s ready to drink within a day or two. With bottles, you need to wash and sanitize 50-some brown glass bottles, then mix in a controlled amount of sugar (called priming sugar) into the beer (which is consumed by the remaining yeast, but this time the CO2 is captured by the bottle cap and carbonates the liquid). Natural carbonation this way takes a week or two, so you have to wait longer to try your beer. Since it’s not pasteurized, homebrew is still “alive” and generally improves with age, like a fine wine. If your beer tastes weird when it’s fresh, give it a few weeks in the bottles to mellow out. Altogether, homebrewing is fun and pretty easy. It takes about 3-4 hours on brew day, and 2-3 hours on bottle day. While there are several good books (notably the Palmer book and the Papazian book), you can really get away without knowing much about the process, and just following the directions in the extract kits. Sanitation is really the only critical thing in homebrewing, you need to ensure that you clean everything well, and use sanitizer (my friends and I like EZ-Clean and StarSan) on anything that will touch non-boiling beer or wort (that is, you don’t need to sanitize your brewing pot or stirring spoon, as they will have the heck boiled out of them by the end of the hour-long boil). Basically the warm, sweet sugary wort is very tasty for mean bacteria, and we want to make sure our awesome yeasties dominate the culture of the beer, so we need to try to remove as many other microbes from our tools as possible. I’ve never had a batch “go bad” but one of my friends in Pittsburgh had a batch get infected, and he had to toss that batch and really scrub all his equipment to get rid of that nasty microbe. I’ve been keeping pretty meticulous records, and in 3.5 years I’ve spent $963 on equipment and ingredients for 21 batches of 5 gallons, which is about 1000 bottles, so I’m below $1/bottle now. My friends and I like to do mail order from Northern Brewer, MoreBeer, and Austin Homebrew (but mostly Northern Brewer, woo Minnesota!). Some places offer flat rate $8-$10 shipping, or we get a bunch of people together to make a big order and split the shipping cost.